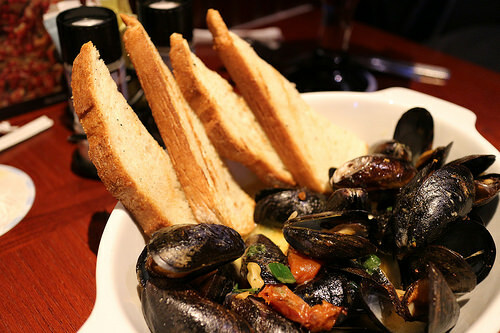 St. Arnold’s Mussel Bar is a dining institution in the area that is truly not to be missed. Adored by locals and tourists alike, this low-key restaurant and bar offers tasty foods and drinks in a fun, inviting atmosphere. An open-air front area is perfect for taking in warmer days, but the bar will welcome you in during the winter when you just need to warm up over a bucket of mussels, a cold beer and a bar full of good friends. You’ll find great specials throughout the week at St. Arnold’s. On Mondays, you can kick off the week with all night happy hour, where you’ll dive into $11 mussel pots, add frites for only $3, and half-price specialty beers all night. Tuesday also features all night happy hour with half-price apps and wine bottles. Every Monday through Friday from 4 p.m. until 7 p.m. you can enjoy $11 mussel pots, half-price chicken wings and onion rings, and $5 liters and half-liters of your favorite beers. Come be part of the neighborhood at St. Arnold’s Mussel Bar.